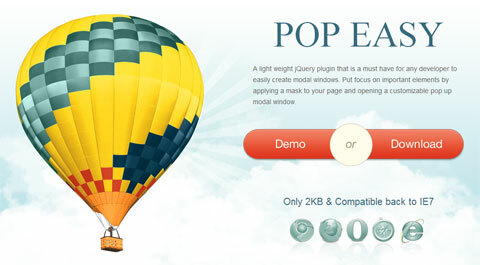 Pop Easy is a jQuery plugin for quickly creating completely customizable modals. Regarding the design, the default modal already has a good-looking interface and it can be changed/improved with CSS. There are options for customizing the animation used when the modal appears, its speed, the opacity, if it’ll be opened onLoad and more. Considering the size, the plugin is very useful. One thing seems to be missing for now is the built-in ability to load remote data (Ajax). The plugin is lightweight (2kb) and has support for displaying any HTML element, including videos.